Writer on the Masorah, and editor of the Hebrew Bible; born at Mosbach (Baden), Sept. 18, 1825; died at Biebrich-on-the-Rhine, March, 1897. As early as 1844, Baer commenced his Masoretic studies. He belonged to the school of Wolf Heidenheim, some of whose original manuscripts were in his possession. Few scholars in the nineteenth century had so intimate an acquaintance with all the details of the Masorah as had Baer; and it was largely due to him that the study of this branch of Hebrew philology was brought to the notice of Biblical critics. His friendship with Franz Delitzsch, who stood sponsor for much of his work, aided him in making known to the world the results of his studies. He never occupied an academic position, but was contented with the office of Hebrew teacher to the Jewish community of Biebrich. In recognition of his services to the Commission for the History of the Jews in Germany, the honorary degree of doctor of philosophy was conferred upon him by the University of Leipsic. In conjunction with Delitzsch he published in 1861 an edition of the Psalms (Leipsic, Doerfling und Franke). A second edition was published a few years later (Leipsic, Brockhaus). In the mean time, in connection with Delitzsch, Baer had conceived the plan of editing anew the books of the Old Testament in Hebrew, following strictly the Masoretic tradition. The volumes, with a Latin preface by Delitzsch, appeared (Leipsic, Tauchnitz) in the following order: Genesis, 1869; Isaiah, 1872; Job, 1875; Minor Prophets, 1878; Psalms (together with a treatise "Elementa Accentuationis Metricæ"), 1880; Proverbs (together with "De Primorum Vocabulorum Dagessatione"), 1880; Daniel, Ezra, and Nehemiah (together with "Chaldaismi Biblici Adumbratio" and a treatise by Friedrich Delitzsch on the Babylonian proper names in these books), were published in 1882; Ezekiel (with "Specimen Glossarii Ezechielico-Babylonici" by Friedrich Delitzsch), appeared in 1884; followed by the five Megillot, 1886; the book of Chronicles, 1888; Jeremiah, 1890; Joshua and Judges, 1891; and finally Kings, 1895. The last two were edited by Baer alone, Delitzsch having died in 1890. Death prevented Baer from finishing the series. Attached to each volume were a number of Masoretic notes taken from the best editions and manuscripts, variant readings between the Occidentals and Orientals, between Ben Asher and Ben Naphtali, and various other Masoretic lists and enumerations. In general, Baer's text has been accepted as representing the Masoretic tradition; even though exception may be taken to his view on individual points or to his too extensive generalization from insufficient manuscript evidence. Christian Ginsburg, in his introduction to his Masoretic Bible (London, 1897), has criticized a number of these faults with some severity. He points out, among other things, that Baer has indicated the open and closed sections in the Prophets and the Hagiographa, a thing not usuallydone in Masoretic manuscripts (pp. 10 et seq. ); that he has introduced a number of anti-Masoretic pauses (p. 29); that his division of the Sedarim is faulty (p. 41); that he has introduced the dagesh into the first letter of words when the preceding word ends with the same letter (p. 117), as well as the dagesh which follows upon a guttural with silent shewa and a ḥatef-pataḥ under the first of two similar letters (pp. 466, 662), all of which are not warranted by the best manuscripts. The Masoretic notes at the end of Baer's edition are also criticized (p. 92), especially the lists of various readings. Further, the Aramaic paradigms attached to the edition of Daniel, Ezra, and Nehemiah have also been the subject of criticism on the part of Kautzsch ("Grammatik des Biblisch-Aramäischen," p. 23). Many of these faults were due to Baer's inability to consult manuscripts in the large European collections; yet, in spite of this, his editions will remain for some time to come the standard Masoretic text. 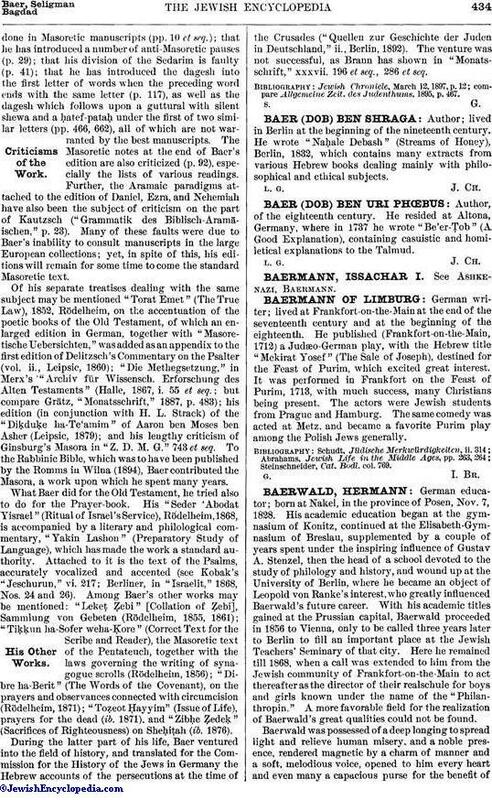 Of his separate treatises dealing with the same subject may be mentioned "Torat Emet" (The True Law), 1852, Rödelheim, on the accentuation of the poetic books of the Old Testament, of which an enlarged edition in German, together with "Masoretische Uebersichten," was added as an appendix to the first edition of Delitzsch's Commentary on the Psalter (vol. ii., Leipsic, 1860); "Die Methegsetzung," in Merx's "Archiv für Wissensch. Erforschung des Alten Testaments" (Halle, 1867, i. 55 et seq. ; but compare Grätz, "Monatsschrift," 1887, p. 483); his edition (in conjunction with H. L. Strack) of the "Diḳduḳe ha-Te'amim" of Aaron ben Moses ben Asher (Leipsic, 1879); and his lengthy criticism of Ginsburg's Masora in "Z. D. M. G." 743 et seq. 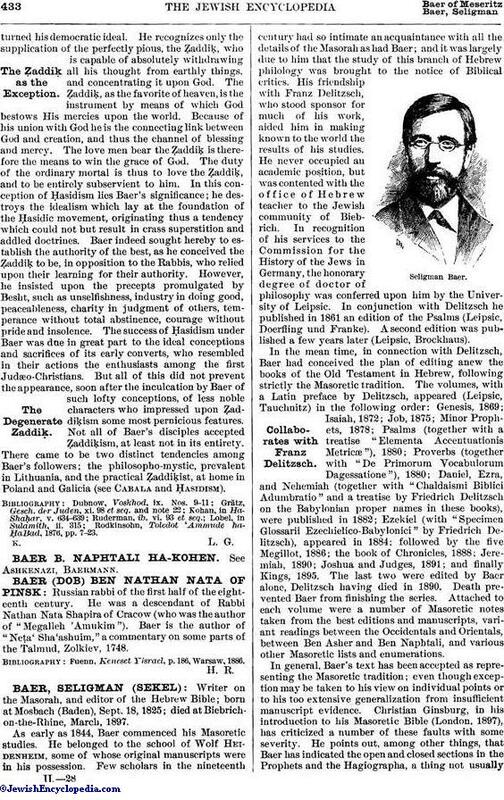 To the Rabbinic Bible, which was to have been published by the Romms in Wilna (1894), Baer contributed the Masora, a work upon which he spent many years. What Baer did for the Old Testament, he tried also to do for the Prayer-book. His "Seder 'Abodat Yisrael" (Ritual of Israel's Service), Rödelheim, 1868, is accompanied by a literary and philological commentary, "Yakin Lashon" (Preparatory Study of Language), which has made the work a standard authority. Attached to it is the text of the Psalms, accurately vocalized and accented (see Kobak's "Jeschurun," vi. 217; Berliner, in "Israelit," 1868, Nos. 24 and 26). Among Baer's other works may be mentioned: "Lekeṭ Ẓebi" [Collation of Ẓebi], Sammlung von Gebeten (Rödelheim, 1855, 1861); "Tiḳḳun ha-Sofer weha-Ḳore" (Correct Text for the Scribe and Reader), the Masoretic text of the Pentateuch, together with the laws governing the writing of synagogue scrolls (Rödelheim, 1856); "Dibre ha-Berit" (The Words of the Covenant), on the prayers and observances connected with circumcision (Rödelheim, 1871); "Toẓeot Ḥayyim" (Issue of Life), prayers for the dead (ib. 1871), and "Zibḥe Ẓedeḳ" (Sacrifices of Righteousness) on Sheḥiṭah (ib. 1876). During the latter part of his life, Baer ventured into the field of history, and translated for the Commission for the History of the Jews in Germany the Hebrew accounts of the persecutions at the time of the Crusades ("Quellen zur Geschichte der Juden in Deutschland," ii., Berlin, 1892). The venture was not successful, as Brann has shown in "Monatsschrift," xxxvii. 196 et seq., 286 et seq. compare Allgemeine Zeit. des Judenthums, 1895, p. 467.